A L Lloyd was fond of saying that folk music is rather like the elephant and the blind man. What he meant was that, since there is no objective reality which we can call folk music, your impression of the beast depends on the angle from which you approach it. Some discern the voice of the struggling masses, some recall a noble peasantry, some discern the trumpet call of a lost civilisation. What you find in the beast naturally colours the sounds you expect it to make. 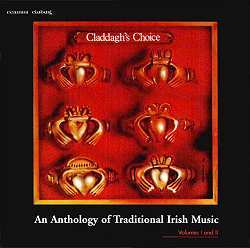 Claddagh's Choice of Irish music, therefore, does not reflect an objective Irish tradition. It reflects Claddagh's view of that tradition. Nonetheless, from where I'm standing, it ain't half a bad one. It would be unfair to describe this double CD simply as a sampler. With the cover illustration looking rather like a jeweller's tray, it is more of a showcase for Claddagh Records. Indeed, readers sufficiently long in the tooth will have seen those Claddagh Rings before. Volume one was issued as an LP in the late 70s. and anyone who has the hard copies of Musical Traditions, before it became a net surfer's paradise, can read the review by Steve Harrison. Now, by coupling it with volume two, the story has been brought almost up to date. It is worth my stating an interest at this point, namely that I regard Claddagh as something of an aristocrat among Irish record companies. Also, most of the LPs represented by volume one have been in my collection for so long that the sounds from them seem embedded in my living room wallpaper. Therefore, in a world, where everything seems to change for the worst, I am glad to report that Claddagh's standards have been very well maintained. Both discs contain tracks which aspire towards Irish art music and I will express some reservations about these presently. However, it is good to see Claddagh continuing to shun some of the gimmicks which have been pervaded Irish music for the last couple of decades. Claddagh's view, then. There are thirty tracks in all and they cover songs in Irish, songs in English, an assortment of traditional musicians - including some fabulous pipers, and there are recordings which hint at a reawakened classical heritage. Considering the esteem in which songs in that language are held, it is surprising to find the Gaelic tradition polished off in two tracks, neither of which give much idea as to what the sean nós sounds like in full cry. That may seem a strange thing to say, especially when we consider that the protagonists are two of the biggest legends in Gaeldom; Maíre Áine ní Dhonnchadha and Séan 'ac Dhonncha, both from Connemara. Maíre Áine's contribution, An Faoitín (The Whiting) is a lively little occupational song. It is delightfully sung and, on her LP (Deora Aille, Claddagh CC6), it makes a welcome contrast to some of the weightier items. (sound clip) Nevertheless, those other items constitute some rare gems of Irish tradition. They include splendid versions of Dónall óg, An Sagairtín and Nóra Ní Chonchuir Bháin, to say nothing of an extraordinary version of one of the oldest songs still extant in Irish tradition, Úna Bhán. They constitute formidable tests of a singer's mettle and any one of them would have given a far better picture of what this lady was capable. I am puzzled, by the way, over Paddy Moloney's booklet note to the effect that "she represents stylistically the purest tradition which Séan Ó Riada considered to be courtly". If anyone can explain what this means I would be glad to know. Claddagh should have been on firmer ground with Séan 'ac Dhonncha's contribution, A Spailpína Rún, even though many purists would quibble over the choosing of a Munster song, rather than one in Séan's native Connacht dialect. As a monoglot Englishman I am not very troubled by such considerations. However, the disc from which it was taken, An Aill Bháin, was cut during what is widely regarded as a low point in Séan's artistic career. My own view is that other his recordings, those on Gael Linn and Topic, to say nothing of a splendid session for Alan Lomax in Dublin, 1951, are the work of a supreme master. For anyone seeking comparison, Séan's Topic recording of A Spailpína Rún can be heard on the Ossian re-issue, More Grand Airs of Connemara. The fortunes of the English language are rather better served, largely because of the presence of Len Graham and of those two first ladies of song, Sarah and Rita Keane. The Keane's contribution, A Stór mo Chrói (sound clip) has, despite being a composition of Brian O'Higgins, become a warhorse for entrants of traditional ballad competitions. In such circles, I confess it has become rather wearying. Yet Sarah and Rita Keane's recording of this song has been a part of my life almost since its release in 1968, and it still cuts me to ribbons. Len appears in two guises, as solo singer with accompaniment from Fintan MacManus, and as the singer with Skylark. Either way he scoops all the accolades as possibly the finest singer of Anglo-Irish ballads alive today. I am less happy with Lord Gregory, Dolly MacMahon's contribution. Despite John Montague's booklet note that she sings the version known as The Lass of Aughrim, from Joyce's The Dead, what we get is a drastic truncation of the one Seamus Ennis and Alan Lomax recorded from Elizabeth Cronin of Ballyvourney, West Cork. Mrs Cronin's rendering of Lord Gregory has been described as "one of the finest performances of a traditional ballad on record". I cannot say the same here. Mrs MacMahon's style is a familiar one in competition circles, where this particular ballad - which incidentally has more claim to be Scottish than Irish - is another favourite with the judges. Unfortunately, the sweet, wistful tone adopted here bears little resemblance to the way Irish country people actually sang and does little to convey the trauma of one of the most tragic and redoubtable ballads in the English language. The radio producer, Charles Parker, once remarked to me that "you don't have to imagine what it was like to stand outside the gates of Lord Gregory's castle with a dying child in your arms. You listen to Elizabeth Cronin and you know". I doubt that he would have said the same of the present performance. Reserve of a different kind is heard in the first of many piping pieces which adorn this set. It is the air, Easter Snow, played with great dignity by Seamus Ennis. The melody has been associated with a townland in Roscommon and may therefore be of Connaught origin. Nevertheless, it is an extremely popular piece in Ulster. The collectors, Sam Henry and Peter Kennedy, both reported it from that province, and a version was played on the fiddle by John Doherty, while yet another turns up in the repertoire of Paddy Tunney. I have no certain knowledge as to where Ennis came by this splendid setting, but I do have a vague recollection of him saying that he got it from Frank Cassidy of Teelin, Donegal. The idea, which Ennis helped to propagate, of the piping craft as a gentleman's occupation, is something of a myth. Nevertheless, on tunes like this, he carried the part off to perfection. Myth or no, Paddy Moloney, the gentleman who plays the pipes with the Chieftains, is also a major associate of Claddagh records. It is not surprising therefore to find that instrument making the lion's contribution. Willie Clancy has been overlooked and I find that a strange omission. There could have been no better choice and Claddagh had plenty to choose from. Otherwise, apart from Ennis, the late generation is represented by Dan Dowd and by that astonishing virtuoso, Leo Rowsome. Rowsome is not at his best here. The recording was made late in life and, if I recall correctly, he had suffered a stroke some time previous. Nevertheless, while his best work lies on pre-war 78s, The two jigs he plays here represent a formidable piece of piping. The younger generation of piping Paganinis, to use another A L Lloyd-ism, encompasses Robbie Hannan, Micheál Ó Briain and Ronan Browne. Browne is heard in two settings, as companion to Peadar O'Loughlin, and on his own as the player of an intensely moving setting of Port na bPúcai [The Fairy Music] (sound clip). It is a strange and beautiful piece, quite unlike anything I've heard in Ireland or anywhere else. The story goes that a fiddler on the Blasket Isles, off County Kerry, was dozing one night and, on hearing this tune, attributed it to the fairies. As a more rational explanation of the tune's mournful, wailing sound, It has been suggested that what the fiddler actually heard was a school of whales calling to each other. Here the piece has been stripped of whale and fiddle connotations, and sounds as though it were made for the pipes. I recently heard this aristocrat of instruments described as sounding "like God coming over the mountain". A naive conception, but a very apt one. Talents of the sort arrayed on these discs have led various observers to conclude that the Irish tradition is inherently virtuosic; that musicians such as these represent a vein of skill which was forced underground by the depredations of Cromwell, and which reappeared in the traditions of the common people of Ireland. In pondering the implications of this view it would be wise to consider how it arose. British oppression of Ireland goes back many centuries. However, it is only in the century which follows the 1798 uprising, and the subsequent incorporation of Ireland into the United Kingdom, that Irish people started to develop aspirations towards a clearly defined national identity. Nineteenth century British Government policy in fact achieved two things. It entrenched Irish hostility towards her oppressors and it pushed the Irish middle classes into realising that distancing themselves from imperial oppression meant distancing themselves from British cultural influence. That in turn meant looking towards the manners and customs of their own native people. There was nothing unusual in this. Subject races from Scotland to Transylvania were discovering, and to some extent re-inventing, the costumes, languages, customs and folklore of their peasant compatriots. The logic behind these movements was that the peasantry, as the most socially isolated segment of society, was also the most culturally pure. They were the most Ukranian, the most Finnish, or the most Irish. In the latter country, however, the process was taken a stage further. There it was held that seventeenth century dispossession of the native aristocracy had dissipated the professional entertainers of that aristocracy among the peasantry. Along with them went the entertainment forms which they used to perform. Thus, the folkloristic artefacts of the peasantry, songs, tunes, dances, folk tales etc., were simply those of the old bardic order of Ireland transplanted. To put it another way, because the folklore of the Irish people pre-dated dispossession, it was both purely Irish and unsullied of British influences. That view has shaped the way people think about Irish music ever since. As a philosophy it is not devoid of substance, but it presents us with a number of difficulties. Firstly, there is the tacit assumption, which was given the stamp of authority by Daniel Corkery's The Hidden Ireland, that before they absorbed the bardic order, the ordinary folk had no entertainment forms of their own. Common sense decrees that they must have done. Also, that these forms probably overlapped with and drew from the more classical ones, just as happens today in many third world countries. As with third world cultures, the two would probably have resembled each other in many salient characteristics and this resemblance would have facilitated their eventual merging. Therefore, it is likely that the folk traditions of post-dispossession Ireland represent not so much an absorption of classical culture, as a synthesis of higher and lower elements. Secondly, most of the present day dance music tradition actually post-dates dispossession, in that the incoming Protestant ascendancy brought with them an interest in country dance forms. The high performance standards of many Irish musicians, therefore, are the legacy not so much of patronisation by the Gaelic aristocracy, as of patronisation by their usurpers. Thirdly, absorption of the bardic heritage by the folk seems to have been somewhat sporadic. The sean nós, for example, might well be founded on melodies and singing styles which hark back to pre-dispossession times - we have no way of telling. However, the texts of Gaelic folksongs, wonderfully effusive as they are, bear little resemblance to classical Gaelic literature. Similarly, the pre-dispossession harp tradition has been lost almost in its entirety. No more than a handful of pieces have come down to us from this era, and the ones which survived have done so in manuscript form. There is another problem with reifications of classical Irishness. For me the most important aspect of any form of folk music, whether it be played by a County Clare carpenter, or a Rumanian shepherd, or a Kentucky coal miner, is that it belongs in the hands of ordinary people. It is made by them. It is shaped by them. It is the end product of their feelings and their hopes and aspirations and their sorrows and their joys. To see folk music as simply the residue of a former and nobler age is to misunderstand the reasons for its continued existence. It in fact de-noblises it. Nevertheless, when John Reidy (aka Séan Ó Riada), wished to develop a native Irish classical style of playing, he believed he could find it by searching among players of the vernacular tradition. It was by all accounts a rather grudging search. He is supposed to have said of Ceili bands in particular that he would shoot all the others, but keep the Tulla. Whatever the accuracy of that ascription, Ó Riada's dislike of ceili bands is well known and presumably extended as far as the Liverpool. I protest, although not on the grounds that nobody should ever be shot for making music. My reasons are more sentimental. It was the individual and collective talents of The Liverpool, one of the powerhouses of the ceili band scene at the time Ó Riada was supposed to have made that remark, which first taught me to love Irish music. Séan Ó Riada is heard on the first of these discs playing a slow air, Aisling Gheal, on the harpsichord. It is a song air, nowadays redundant in the song tradition, and in my view it does not transfer successfully to Ó Riada's chosen instrument. The melody would flow well enough on the pipes or the flute, but here it sounds halting and uncertain and not at all like any of the great masters of slow air playing. Ó Riada went to great pains to stress the incompatibility of Irish music and the European high art tradition. His performance of an indigenous Irish melody on a classical instrument does nothing to undermine his own thesis. It was Séan Ó Riada who, via his spawning of Ceóiltoirí Cualann, was indirectly responsible for the creation of the Chieftains. They are heard on two tracks and their harper, Derek Bell, contributes a further two. There are additional tracks from members, Sean Keane and Michael Tubridy, although these are nearer to the mainstream Irish tradition. I cannot say that I found much more satisfaction with the Chieftains and Derek Bell than I did with Aisling Gheal. The problem with this approach to music is that it fails the acid tests both of art and tradition. On the one hand, it has very little emotional lift, that tension between joy and sorrow which characterises great traditional players everywhere. On the other it lacks the creative genius by which Bartok, Vaughan Williams and Mahler, among others, were able to take their native traditions and transform them into a completely different artistic genre. A philological note. I am scarce qualified to ponder the matter, but I am puzzled over the translation of one of the Chieftains' pieces. That ace and deuce of piping tunes, The Gold Ring is normally rendered into Irish as An Fáinne Óir. (Fáinne = ring and óir = gold). This is the piece which Seamus Ennis used to play as accompaniment to the story of the man who disturbed the fairy piper; who subsequently returned the ring which the piper dropped as he fled; and who was taught this magnificent double jig as just reward. An Fáinne Óir is the title Ennis used. The booklet, on the other hand, gives the translation as An Faire and my Gearrfhoclóir Gaeilge-Béarla, renders this into English as meaning a vigil or a wake, which would not accord with the meaning of the story. To compound the confusion, Paddy Moloney's notes tell us that Bunting published the piece as An Pharra, to signify that it was once used as a war tune. An pharra, or to use the modern Gaelic spelling, farra, is cognate with the English word war, but that is not the word used here. I have dealt with the question of the Chieftains and their associates in some depth, partly because the Chieftains are seen by many as Claddagh's flagship and partly because there are many others who regard them as the apotheosis of Irish music. Also, there is a large, less than committed audience, for whom the Chieftains have made Irish music acceptable by refining the idiom and redefining it. Cogitating on the appeal of the Chieftains, I suspect there are strong parallels with that which exists for Classic FM. Classic FM has introduced the music of the great masters to a vast new audience, but it has been able to do so only by serving up their works in short, easily digestible sound bites. It has reduced some of the most wonderful music ever created in the Western European art tradition to the status of wallpaper. As a showcase for Claddagh records, then, these discs have much to commend them. As a sampler, if you have almost reached the millennium without discovering the Claddagh catalogue, this is an excellent opportunity to find out what's in there. But, as a representation of Irish tradition, remember the story of the blind man and the elephant.